The continuity system, that Modern Hollywood adheres to, hopes to unite ‘the potentially dis-unifying force of editing by establishing a smooth flow from shot to shot’◊ Mise-en-Scene [basically ‘what you see’] is included into that continuity system. 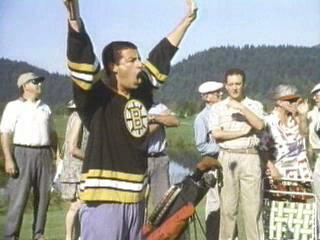 At all times in Happy Gilmore conflict, important to the narrative structure, has to be communicated to the audience. This is achieved by the simple technique of foregrounding diametrically opposed forces thrust together and unable to part. In Happy Gilmore this is the violent Ice Hockey-playing Sandler and the calm, mannered golf community thrust together by circumstance. His clothes, as indicated by the photo, are at odds with the pastel colours of the crowd and his mannerisms, extreme displays of pleasure, are at odds with the reserved displays of displeasure. This overt and rather brash technique is not just used in comedy films but all Hollywood films because at all times the audience must be aware of the tension and conflict that contributes to the narrative. In essence at no time in Happy Gilmore must the audience not know what the ultimate goal is and who the protagonist and antagonist are.